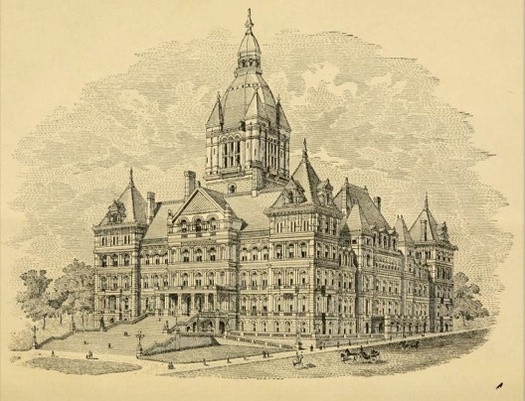 Spotted in an 1889 brochure on the state Capitol's ongoing construction: This plan that included a central tower. The original plans called for a dome; Isaac Perry, who supervised the final phase of the construction, suggested the tower seen here after structural problems made the dome impossible. The Capitol, which took 32 years to build, endured multiple changes of architects -- and architectural styles. As the book Albany Architecture notes, "The Great Pyramid at Giza [was] constructed faster and the nation's Capitol built at half the cost." In 1899, having already taken up more time and more money than anyone had thought possible, the Capitol was declared finished. It's kind of nice, though. It is an amazing building. I have taken the tour three times and each time I go I learn something new. If you have never been plan to go on a guided tour. The guides are great and a lot of information about the building and its history. The Capitol is such a beautiful building, inside and out. I'm kind of glad they left that central tower out; I like it the way it is! Are you telling me it took longer and cost more than other government buildings and remains unfinished??? ?